What is the most cost efficient? To food shop daily, weekly or monthly? Public domain image by Leon Brooks. Saving money is key for many as they shop, but for all of us it takes learning the hacks to make that shopping trip the most effective and inexpensive. However a person chooses to shop, the best technique is “plan your work” and “work your plan” in terms of shopping, meaning if one is looking to save, a person needs to know their prices, have their list of items to buy prepared in advance and not divert from their list. It’s those impulse buys that tend to sink most shopping budgets. We’ve entered into a world where people are pressed for time and tend to “club shop,” feeling as if they save time and money. While with buying in bulk one always thinks that savings are the end-all, that’s not always the case. Known as “European-style shopping,” is what the daily shopping experience is like. While Europe has larger grocery stores, many make their purchases fresh daily for staples like meats, breads, produce and cheeses, purchasing only what they need. While the United States has transitioned in many communities to larger markets, Europeans may often go to a range of locations to buy their purchases each day, and in addition to larger markets, have smaller purveyors they can also choose from: a local farmers’ market for fruits, veggies and cheese, a bakery for their breads, a butcher for their meats and so on. 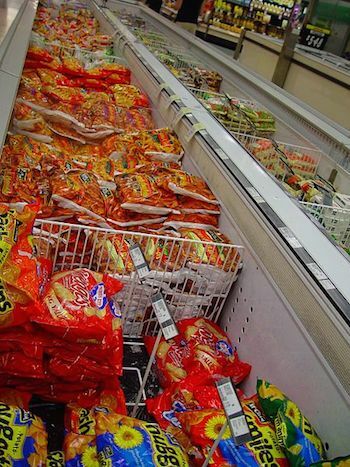 Some find it less cost effective to bulk shop. Sometimes, bulk shopping can entail paying extra for the “convenience” of the large packages, including fuel surcharges to truck large items to the stores. Plus, it can lead to impulse shopping from even those who consider themselves the most disciplined of shoppers. Additionally though, especially with fresh items like produce, one runs the risk of purchasing something that you vow to yourself you’ll use, and then it goes bad. For example, an extra large bag of spinach on sale may not be finished by the time it starts to wilt into rottenness, and is forgotten in the back of the fridge or crisper drawer. That of, course, is a total waste of money if one cannot finish the bag off on time. But buying just what one needs and planning a meal on the fly for that evening that’s simple, such as broiling a fish filet quickly, along with a side of veggies, can be a way to ensure items are consumed that day, and there is no food waste to worry about. No waste equals monies saved. Shopping experts also say that sometimes stores mark items on sale dramatically, in order to reduce inventory, such as in the meat department. If one is able to stop into the store daily, they may thankfully hit these sales, which aren’t typically advertised and are only visible when one walks through the store’s meat department. And if for some reason one can’t use an item from the meat department that particular night, such as if it’s a pot roast and requires longer cooking time, it can always be held over in the fridge overnight and make a trip to the crock pot for simmering the following morning. Shopping each day should be simple. One needs to have a plan and not stick to it, or else it’s easy to slip into impulse buys and run up a bill. With some schools of thought, this “European-style shopping” trip is actually more cost-effective than a weekly run, because one who shops weekly may end up spending more, and in the long run, do not have an opportunity to enjoy the fresh items at their peak. It also shouldn’t take long – a person should just run in for those few items they need, and then leave the store. If fresh foods tend to spoil by the end of the week, how can weekly shopping be effective? Some experts advocate purchasing produce, meats and other items each day and using them quickly. Some have found a decline in food waste, which in turn, saves money. It’s also easier to keep track of one’s food inventory this way and just buy what is needed, which is another way to save money. Some experts advocate using the weekend to focus on non-perishable items like canned goods, toiletries, cleaning supplies and paper goods. If a person lives in a metropolitan enough area that a grocery store is easily accessible on the way to or from home, this will work with combining shopping on the day and weekend for some items. Weekend shopping may be best for those who have extenuating circumstances such as a challenging work schedule, or live in remote locations. Then it’s really important to stick to a list to ensure one isn’t drawn into “luxury” items if they are on a budget. Some who weekend shop only prefer it, because they feel that daily shops can take too much of their time. They may consider one weekend trip the “lesser of two evils,” and buy some items during the week, such as a container of milk here and there in between if needed. One shopping expert, Jordan at Fun, Cheap or Free on the other hand, says not to make any outside trips to the store ever, in addition to the weekly run. That’s because one is often tempted, in addition to that container of milk, to buy other items they really don’t need. Instead, she suggests, planning the list accordingly. Even buying powdered milk to sustain until the next shopping trip is a must if it avoids the potential splurge. “That one gallon of milk will cost you $50 in things you suddenly ‘need to have!’” she exclaims. Jordan’s philosophy includes detailed listing, even keeping a running list on one’s cell phone. She typically only shops at Walmart and Costco, and never goes without a list. Jordan also does not personally believe in coupons, as she feels couponing is particularly time consuming for her, and limits purchases. Plus, many items are not covered, except for pantry items. Instead, she pores the store ads for the best buys. She also loves a site called “DealsToMeals” to plan meals…but the best part is that the website searches weekly deals and then plots out the meals for a person (this is a service that costs $5 monthly, but may be limited to geographical location of the stores that are in the site’s database). Jordan advocates a very strict method, which is tracking one’s weekly budget, which for her family of five is $125, and only using an electronic card to track purchases. Then sticking to the list and planning meals. Other savings techniques Jordan uses for her weekly shop? She suggests learning a store’s price matching policy, and then using it! 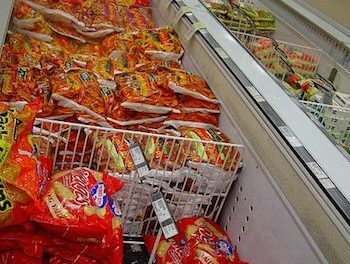 That entails knowing the price of a particular item (such as a one pound box of pasta) in one store and then asking another store to match the same price if it isn’t on sale. That entails doing one’s homework and looking at store fliers from around one’s geographical area. So if for example one store advertises that item on sale, but you shop elsewhere, if you show them the proof of the ad, if a store offers an “ad match” program, they will honor the other store’s sale price to keep your business. There are some shoppers and shopping experts who are in the school of thought that monthly food shopping is the least expensive and easiest. These shoppers find that when one shops daily or weekly, there tends to be impulse buys here and there that appear innocuous at first, but then over time, these purchases add up. However, one must remain, as with all the other shopping methods, disciplined. Some monthly shopping aficionados confess they do the bulk of their shopping once a month, but take a weekly trip to purchase their perishables, and only stick to their list of necessity items. Those who shop mainly once a month feels it also helps them to prioritize. They know what foods “go” in their households, and what foods not to buy in the future. People who successfully save with monthly shopping trips find that they use bulk items they buy. For example, purchasing a large tin of olive oil in bulk can last significantly, even two months considering one’s usage, and may be worth it for some situations, such as if one has a number of people in their household. Shop when one is hungry, because it can trigger impulse purchases. Use “basics” as a gauge for price comparisons between stores, like milk and eggs, but choose other types of items. Fill up a shopping cart to overflowing, because it can lead to impulse purchases, and if possible, instead use a hand basket, or mini-cart. Shopping carts have grown in their design over the years so that people will subconsciously buy more. Start shopping in the produce section, because the colors there may enhance a person’s desire to impulse buy. Shopping in the middle first can snap one back to reality instead of shopping euphoria. Don’t trust the end caps to always have the best deal, because these can be more expensive, promotional items. One’s living space, which can impact the amount of room a person has in their residence for storage of food and supplies. If a person’s pantry space and refrigerator is limited due to being an apartment-dweller, shopping on a daily or weekly basis may be a better bet, because it’s easier to control food purchases. Additionally, if one shops for supplies like paper towels en masse, depending on space constraints for a smaller residence, bulk purchases of these items may not be a possibility. For those with a larger home, buying paper products in bulk might be easier and a way to save since they could have potentially more storage space. A person with a larger home may have a second refrigerator (sometimes one in a garage for overflow) and a deep freezer, which allows a person to bulk up on their purchases of meats on sale and frozen food items. One’s location can be another factor in determining how they can plan their shopping trips. For example, if a person resides a distance from a grocer, daily trips may not be possible because of the fuel cost expended. Or, some may live in a neighborhood where their grocery store has items that they are not pleased with (pricing and/or quality) and need to shop elsewhere. Depending on the proximity from a supermarket, weekly or monthly shops might be better. Some may have a compromise and do a major shop every two or three weeks. One’s living arrangements may be more conducive for a daily grocery run for those who live in city apartments for example, especially if units are navigable via stairs or elevators. It may be simpler to take that trip each day to the store to pick up a few items on the way home, rather than a weekly trip, which could be cumbersome. One’s schedule can determine the best way to shop. If one works odd hours or late, a daily run may not always be conducive because the person may feel time constraints of a shopping trip each night, and would prefer to plan their meals in advance, sometimes for a week, though some, if they have the time, and even the freezer space, may cook their meals on weekends, and freeze portions to use each day. The weather where one lives can also impact their ability to shop. If they live in an area with harsh winters, it might be difficult to navigate to the grocery stores on a daily basis, and for some, doing a weekly, twice monthly or monthly shopping trip, is easier. Click here for Inside Scene’s article on “unit price,” one way to understand pricing between brands per unit sold. Click here to read our other Penny Pincher articles. Like our stories? 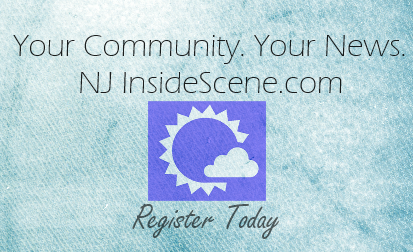 Stay on the scene with Inside Scene and read a variety of in-depth stories about a range of topics. Click here to “like” our newsfeed on Facebook for all of our stories.